SIMetrix/SIMPLIS Elements is our demonstration free version that can be used without license or copying restrictions, for personal, educational and business use. Virtually all features of the full version are enabled but we do restrict the size of the circuit that can be simulated. These limits are generous enough for them to be used for real work and we are happy for our users to do so. 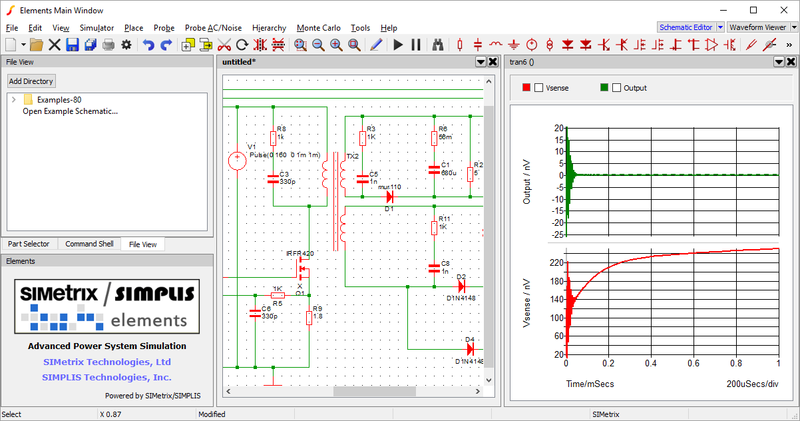 SIMetrix/SIMPLIS Elements comes with the fully featured schematic editor and waveform viewer found in the full version. SIMetrix/SIMPLIS Elements is available for Windows® systems only. There are no limits on the complexity of arbitrary source expressions or arbitrary logic block definitions. There are also no limits on the size of schematic that can be drawn, saved or printed. You are welcome to use SIMetrix/SIMPLIS Elements as a free general purpose schematic drawing tool. The node count includes all circuit nodes and some of these may be internal to device models. Opamp models, for example, will always have a number of internal nodes depending its complexity. A total of no more than 15 state variables. A capacitor or an inductor each requires one state variable. Each time-varying or small-signal AC source requires one state variable, with the exception of SINusoidal or COSinusoidal sources, which require two state variables per source. A total of no more than 10 capacitors or inductors combined. A total of no more than six switches, simple or transistor. A total of no more than six logic gates. A total of no more than 26 "states." Each PWL element requires one state. Each switch requires one state. Each time-varying source requires one state. Each logic gate requires one state. SIMetrix/SIMPLIS Elements requires Windows® 10 (Home, Pro or Enterprise), Windows® 8/8.1 (Standard, Professional or Enterprise) or Windows® 7 (Home Premium or better).